Greenpeace on Monday released its latest "Guide to Greener Electronics" report for 2017, analyzing what steps, if any, 17 of the world's top consumer electronics companies are taking to reduce their impact on the environment. This year, Greenpeace awarded Apple a passable B- grade, touting renewable energy and climate change initiatives, while at the same time lambasting the company over its opposition to "right to repair" legislation. After a four year absence, Greenpeace's Guide returns to take companies to task over internal environmental initiatives, or lack thereof. This year's study focused on three major issues: energy, or the reduction of greenhouse gases through renewable energy; resource consumption issues like sustainable design and use of recycled materials; and chemicals, specifically the elimination of hazardous materials in products and the manufacturing process. 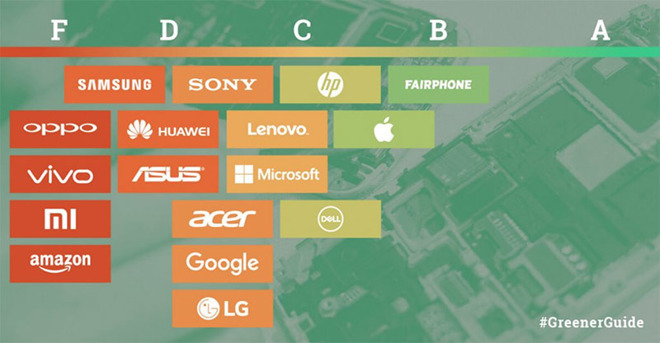 Apple's B- performance was second only to Fairphone, which scored a B for its effort to build an environmentally friendly smartphone and supporting supply chain. With only two products to its name — two versions of the same device — Fairphone appears to be more of an aspirational target than an equal to the other 16 tech firms mentioned in the Greenpeace list, which includes Dell, HP, Microsoft and Samsung. As for Apple, Greenpeace awarded high marks (PDF link) for the company's dedication to renewable energy, singling out solar and wind power projects in the U.S. and China. Greenpeace highlighted Apple's commitment to become a 100 percent renewable energy company, an ambitious goal that is accomplished. Apple also advocates for renewable energy, both for its suppliers and, on a macro scale, government policy. The iPhone maker took a hit, however, for designing products that are not easily repaired by customers or third-party shops. By limiting repair and upgrade paths, Apple forces users to replace devices with new models, leading to increased waste that could negatively impact the environment. Commonly referred to as planned obsolescence, these design decisions earned Apple a D in product life extension under the report's Sustainable Design & Resource Reduction category. This same section earned Apple its lone F grade. In particular, Greenpeace took issue with the firm's stance on "right to repair" legislation. Apple has actively lobbied against bill proposals circulating in multiple U.S. states that would require the company to provide consumers and third-party repair shops access to service manuals and parts. Further, Apple has "blocked attempts to strengthen environmental electronics standards that would encourage device designs that are easier to repair, upgrade, and disassemble for recycling," Greenpeace said. For its part, Apple maintains "right to repair" laws are myopic in scope. In an interview last month, VP of Environment, Policy and Social Initiatives Lisa Jackson said parties touting such legislation are not "looking at the whole problem." From a device's production to its end of life, the most important facet of manufacturing should be making the most out of existing resources, Jackson said. Apple is committing substantial effort toward the development of a closed loop production process in which new devices will be made from recycled components. The company admits it does not yet know how to achieve so-called "circular economy" manufacturing, but potential solutions are in the works. Citing a Motherboard report, Greenpeace notes Apple continues to maintain "must shred" agreements with partner recyclers in the U.S., meaning devices are destroyed rather than recycled. The organization concedes steps are being taken toward a closed loop process, pointing out future projects like the "Liam" iPhone recycling robot. Finally, Greenpeace gave Apple a B for its efforts in eliminating hazardous chemicals from products and the supply chain. Despite Greenpeace's concerns, Apple consistently ranks among the top tech companies in environmental organization's studies. In January, for example, Greenpeace named Apple as the world's most environmentally-friendly tech platform company for the third year in a row, citing a growing investments into clean energy.